Hoversurf is a company based in San Francisco, CA, USA that is working on a hoverbike and a full-scale eVTOL concept. 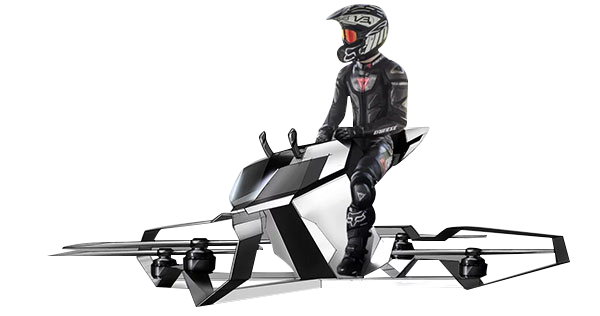 The hoverbike is already flying, and has made appearances in Dubai as a potential police transport and at the Moscowraceway in Moscow. HOVERSURF, a San Francisco, CA, USA company. Hoversurf is based in San Francisco, and has hosted one confirmed round of funding. Since the company already has a marketable and functional prototype that is actively making demonstration flights, they're taking $2,000 deposits for the option to purchase a new Hoverbike for $59,900. The main competitor for an aircraft like the Hoverbike would be the Kitty Hawk Flyer, which occupies a similar market segment, but is currently not for sale.